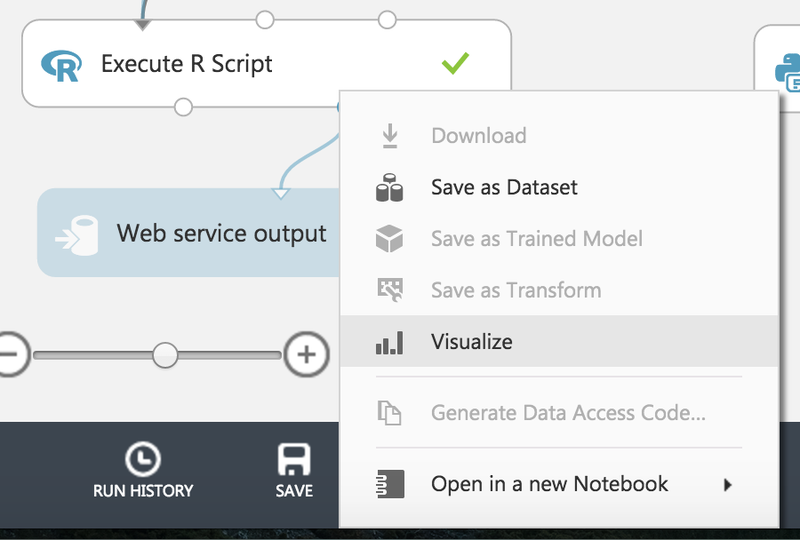 Azure Machine Learning Studio from Microsoft can be used to easily build your data science solutions component by component. One of the major benefits is that in each component you can easily add in some visualizations. When you are satisfied with your data solution you can build a web service from this solution. 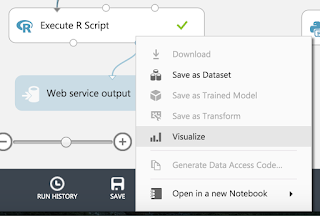 In this blog post I will show you how you also can extract the visualizations from this web service so that you don't lose the visualizations when you are automating your data science solution. 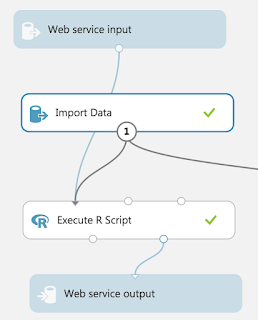 We will build a simple experiment in Azure ML that imports a data file. Next, the input is connected to an R Module. 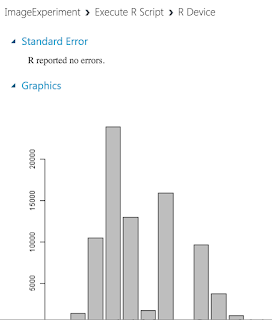 The main goal of this R module is to draw a graph with a bar chart. 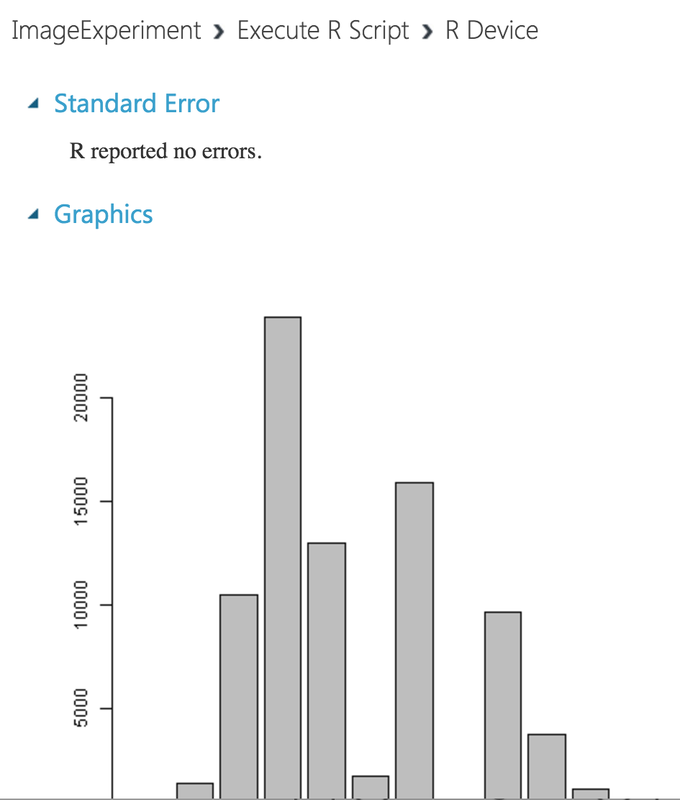 To see this graph chart you can right click on the right dot of the module and select visualize. In the resulting window under the title Graphics you see the image that you want to extract under the graphics title. This will be an example graph that we want to extract in an automated way. Next, we will build the web service that corresponds to this experiment. For this web service we need an input and an output. With the input we can read in a blob storage file and the output we are going to connect with the right dot from the R module. This is the one that you also used to generate the visualization. 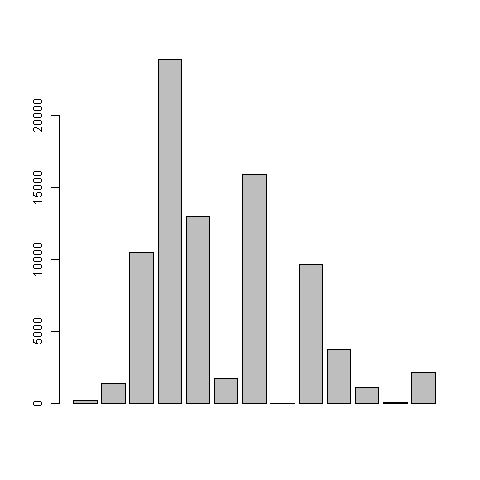 By making this the output we are going to save the content of the window that we visualized in the previous paragraph in a blob storage file. So the major two tasks that are still left for us are to execute the web service to generate the output blob and next to parse this output blob storage file. 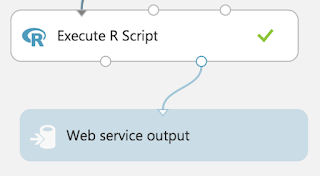 The web service will be generated in a way similar to the way that you you normally generate a web service from Azure ML. We will describe these steps further in an upcoming blog post. 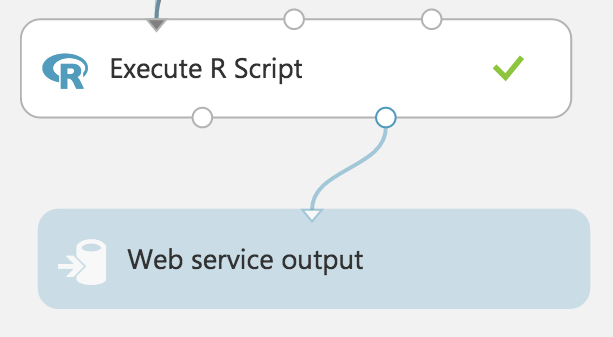 We will execute the web service in the same way that we normally execute a web service generated from Azure ML. The major difference will now be on how we will parse the output file. We will only be focussing on the latter part. First we read in this file and print it's contents to the console to have a better idea of what the file looks like. 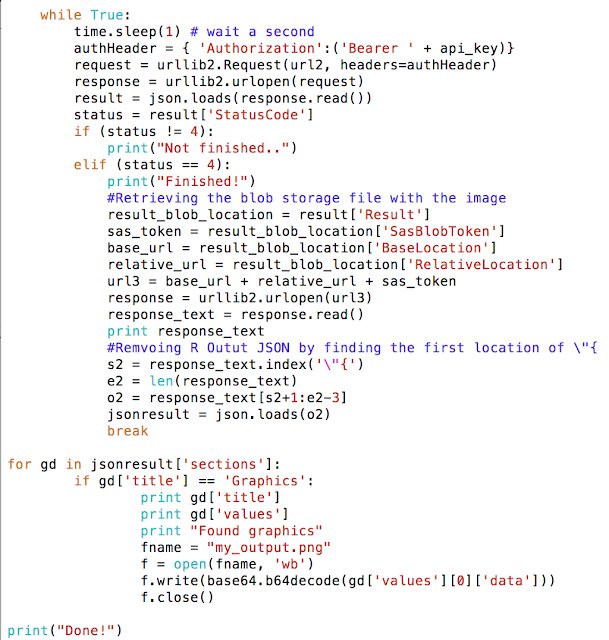 We see that this file starts with R Output JSON, we recognize some JSON formatting and we also see a larger part of text written in random letters and numbers following each other. This part is actually the image represented in PNG encoding in this JSON file. Based on this analysis we know that we need to perform the following tasks to extract this picture. 5. Open the file that you have saved and admire your work. The code that you need for this you can find in the picture below. Below you can find the extracted images from the web service. If you want to use this image directly in html you actually don't need to execute this extra step. In this post I explained how you can extract images that are generated in Azure Machine Learning Studio. This is a step that might help you out in speeding up your data science prototypes. 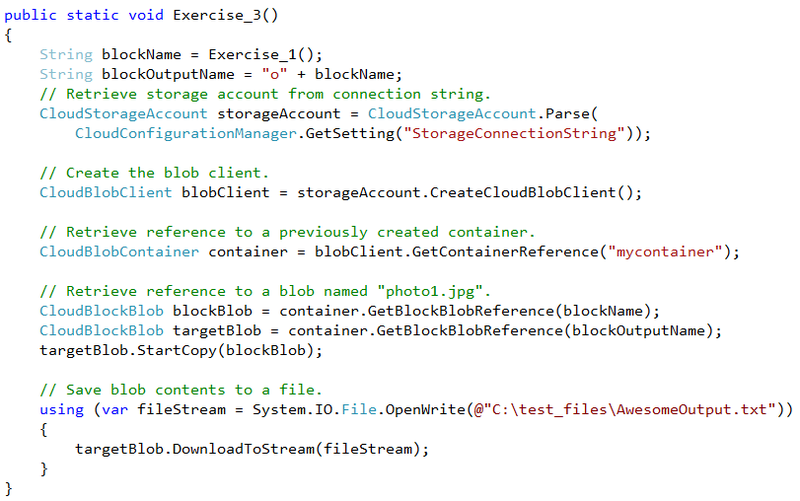 In this blog post I will teach you how you can build your first application with blob storage and C#. The tools that you need to get started are described in the previous blog post. In this blog post I will first repeat the use case and next I will start building the use case step by step. Good luck with the different exercises and if you get stuck, please leave a comment below. We are building the application that is shown in the picture below. We have locally on our computer the file C:\test_files\Awesome_local_file.txt. We have a web service in the cloud that performs a special operation on this file that we can't perform on our file locally. 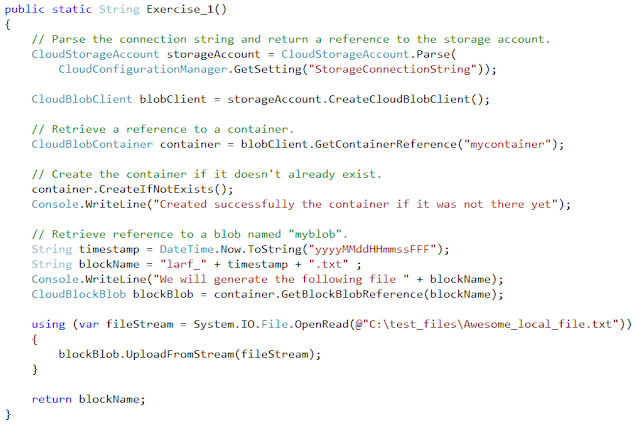 Therefore we will need to upload the Awesome_local_file.txt to my_container as the blob larf_YYYYMMDDHHmm.txt. In this way the Web service will be able to access the file and perform his operation on it. The web service will provide as output the olarf_YYYYMMDDHHmm.txt file which it will store in the container mycontainer. Afterwards you will be able to download this file back to your computer as Awesome_output.txt. The structure of the exercises. You can find here the overview of all the exercises, so that you can each time copy/paste what you need when you are making the exercises. Build the Visual Studio Project as described in the previous blog and make sure that you have started the Microsoft Azure Storage Emulator. Change your Main function in the Program.cs file so that it looks like the code below. When you are working on an exercise, you need to delete the // from the fourth line and adjust the number from the exercise that you are working on and next you can execute your exercise. The following libraries will be used during the exercises. Make sure to add them in the beginning of the file Program.cs. Press Start from the toolbar and a Console window will appear, hit two times Enter and your Console Window will close again. Make a folder on your C drive that is called test_files. Make in this folder a text file that you give the name Awesome_local_file.txt. In what follows we will teach you the code how you can copy this file to blob storage, so that a potential web service in the cloud can use this. 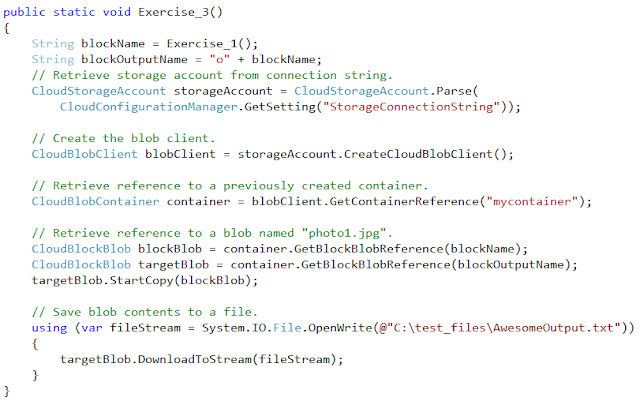 Before we can upload Awesome_local_file.txt to the cloud, we need to be able to connect to our blob storage account and create a container in the cloud, the equivalent of a directory on your computer. We can achieve this by using the code of Exercise_0 below. Add this function to the Program.cs file and make sure that you have uncommented Exercise_0 in the Main file. Run your program. When you have executed your program. The container mycontainer has been created and this looks schematically like the following picture. 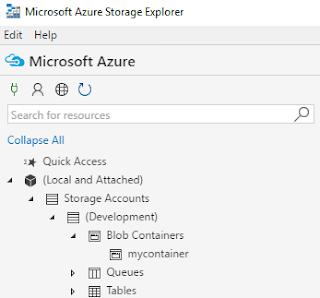 If you want to check whether mycontainer has been created successfully, you can open the Microsoft Azure Storage Explorer that we have installed in the previous blog. 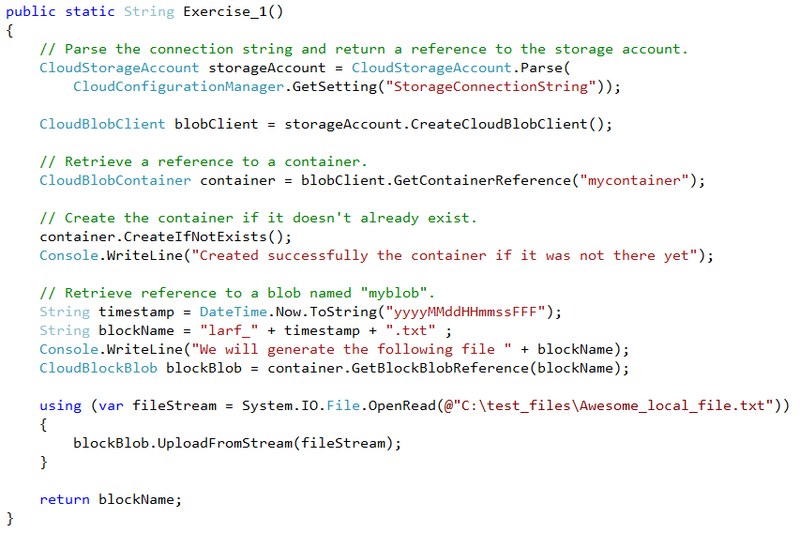 You will see that the container mycontainer is now part of your Blob Containers in the (Development) Storage Account. We will now copy Awesome_local_file.txt to the cloud. Because the name of this file might not be that unique in the cloud, we are adding in a unique identifier to this file in the cloud and we will call the file in the cloud larf_YYYYMMDDHHmm.txt for which we will derive YYYYMMDDHHmm from the current date and time. When we have generated the file name, we will upload Awesome_local_file.txt to the cloud. At the end of the function we will return the name of the newly generated file so that we can use this function in the next exercises. Make sure to change in the Main function the fourth line to Exercise_1 and run the program. We have schematically achieved the following result. In the next exercise we will list all the different files that are available in mycontainer using code. If you can't wait till the end of Exercise_2 to see whether your exercise was successful, you can also use the Microsoft Azure Storage Explore. Make sure that you hit the refresh icon and when you click on mycontainer, you will see the larf_YYYYMMDDHHmm.txt that you have just created. Now we will learn how you can get the list of all the files in mycontainer using code. First you will need to connect to your storage account and ask for a reference to mycontainer. 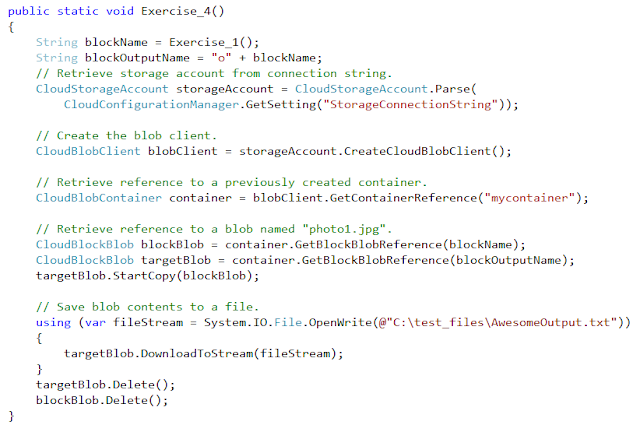 We will get all the different blob items in the container and will print the information of the CloudBlockBlobs, this is the way that a text file is stored in Azure Blob storage. Change in the main function Exercise_1 to Exercise_2 and run the program. You will see something similar as below in your console window. As you may notice from the console window, the (Development) storage account is also called the devstoreaccount1. When you look back at the Microsoft Azure Storage Explorer, you also will see the devstoreaccount1. As an extra exercise, you can also add in the sequence of Exericse_2, Exercise_1 and Exercise_2 in the main file and you can see that Exercise_1 has added in an extra file in mycontainer. Because we have now a copy of Awesome_local_file.txt in the cloud, the Web service will be able to reach it. We will reuse Exercise_1 for this. The Web service will perform some awesome manipulation on this file and will return the result as olarf_YYYYMMDDHHmm.txt. We will mimic this by making a copy of our file in the cloud. Finally we want to have a copy of the result locally and we will therefore download this file to a local file AwesomeOutput.txt in the test_files directory. Make sure again that you are referencing Exercise_3 in the main function and run your program. Go to your test_files directory and you should have now the AwesomeOutput.txt file. Use your preference to check which files are available in mycontainer. You will see that for each time that you are executing Exercise_1 or Exercise_3, you will be generating extra files in the cloud. When you are using the cloud, you should make sure that you are nicely cleaning up your unneeded files because you are paying for these unneeded files. Therefore we will be adding in code now to remove the two cloud files that are generated when you are executing the use case. Execute the following sequence Exercise_2, Exercise_4, Exercise_2 in your main file. You will now see that no extra file has been generated. Similar to the schematic view below. When we are now executing our use case, we are not leaving any files behind in the cloud. Great. But what happens with the old files that we have generated and what happens with mycontainer when we eventually don't need it any more? Therefore we have a final clean up routine. We now will be removing all the extra files in mycontainer and finally will also remove the container. Execute Exercise_5 in your main file. 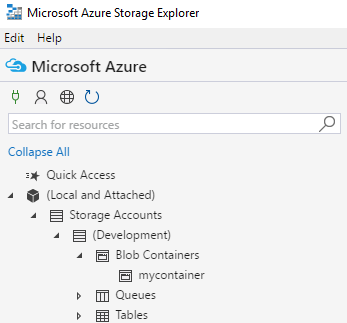 You can next go to the Microsoft Azure Storage Explorer and when you refresh, you will see that mycontainer doesn't exist any more. Schematically this will look as below. Congratulations if you have reached this part of my blog, that means that you have gained some extra knowledge about blob storage. You can find the code also on my github account. 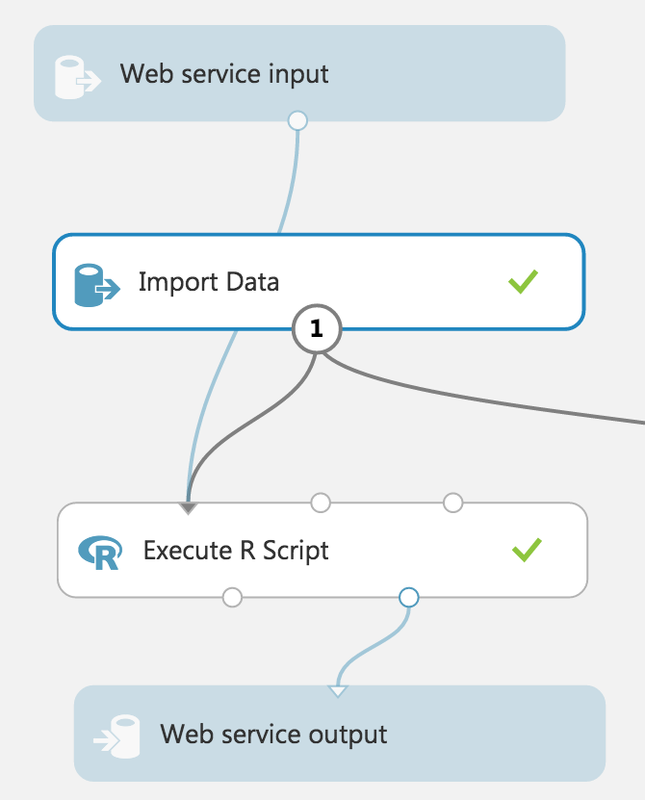 In a next blog I will explain how a web service generated from Azure Machine Learning Studio can use these files from blob storage.